Blogging & Copyright Issues: When Can you use Copyrighted Materials? I would have been thrilled to see my foxhunting collage as the image from the Masters of Foxhound Association’s Thanksgiving message if they’d asked me in advance or listed me as the creator. Unfortunately, they didn’t do either. They had incorporated my image into a graphic design of Thanksgiving cheer. On the bottom right hand side of the greeting, it said something along the lines of, Photographer Unknown and then had their own copyright statement. Now, this isn’t a huge deal. When I contacted them, they were apologetic and removed my image. I’m only calling this out because it made me realize how much more diligent I must be about my material. The accessibility of online images is a double edged sword. It’s much easier to share your work . . . and much easier to use it/steal it, however you want to describe the situation. With so much content on the web, it’s easy to lose track of how your images are used. In this case, a friend alerted me that the image was being used. 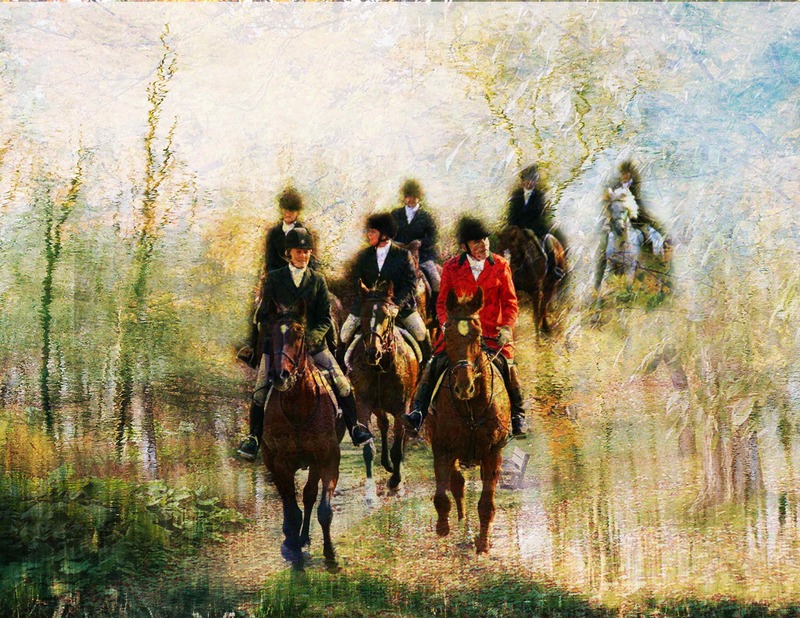 Foxhunting is a small world, so it wasn’t unusual for a friend to recognize my collage and some of the people in it. So, I asked the Association about it. I was using Powerpoint and used the insert online pictures and selected the free creative common license. That is where it came from. It was clipart online. So I tried to find it. I tried using PowerPoint. I tried looking for creative common license. I searched online using http://www.tineye.com which can help you find where an image has been used. The only place I can find it is on my own blog where I clearly identify myself as the creator of the collage and of the original photo. A Bing search also shows that the only place this image has ever occurred is on my own blog. It is not free clipart. Please, folks, when you see that an image is on a site and that “image may be subject to copyright”, ask the site owner for permission. I create collages for my own entertainment, not to make money. But that doesn’t mean that I want other people to appropriate them. If my artwork was my source of income I’d be rightfully angered. According to copyright law, it is not necessary to put a copyright statement on your work. Copyright is automatic; the moment you create a work, you own the copyright. You do not need to register your work or include a copyright notice to have copyright protection. But, it’s not a perfect world. And there are some situations where using copyrighted materials are allowed. There are guidelines under the “Fair Use” Doctrine which allows you to use copyrighted work for certain purposes. I’ve written about this before and the rules are still the same: What is Fair Use of Photography and What Does that Mean for my Blog? You do not need to attribute work that is in the public domain. All works published in the United States before 1923 are in the public domain. That’s one reason why I use vintage postcards and prints in my collages unless I took the photos myself. Photos that are published on Tumblr and Pinterest are fair game because these websites’ terms of service grants the site the right to copy and distribute the work and for other subscribers to the site to do so, as well. What does this mean for your blog? Use your own images as much as possible. Take the time to understand the Fair Use Doctrine. Give credit for images used when you know who took the picture and ask for permission if you are not sure. For me, this also means that I need to aggressively copyright my photos and artwork. Shame on me for not taking the time to do it up front (as this requires me to go back into my archives) and shame on people who are too lazy to ask for permission. Yeah, I’d have preferred an honest response. I understand how tempting it is to use images you find on the Internet. That’s why, whenever possible, I use my own! In fact, if you look at my blog, I have the following statement: Equine Ink by http://www.equineink.com is licensed under a Creative Commons Attribution-NonCommercial 4.0 International License. This means that people are welcome to use my material provided they provide attribution.